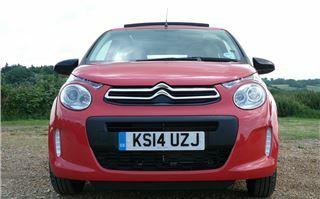 We’ve driven the 2014 Citroen C1 before and first impressions are included in our Car-by-Car entry here. 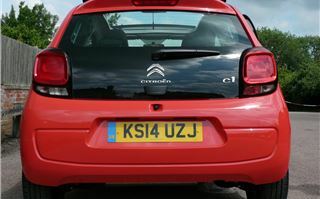 This is a test of the UK spec C1 Airscape 68 Feel Edition and the higher spec Airscape 82 Flair, both of which boast full length fabric sunroofs in the spirit of the original Citroen 2CV. 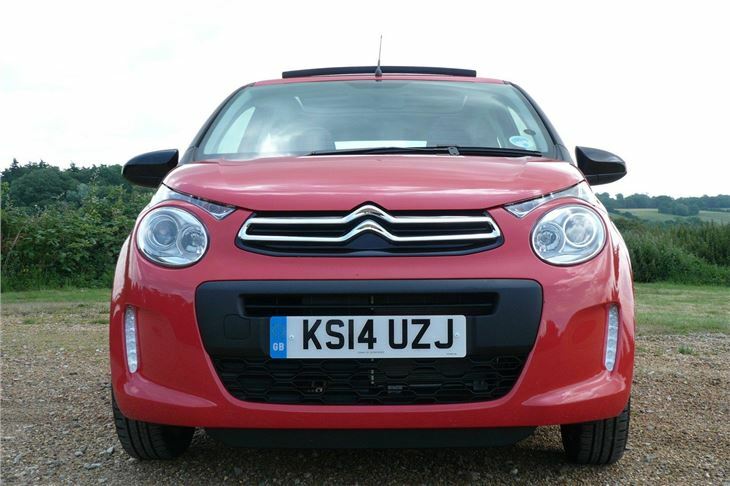 And since the Airscapes only cost £850 more than the standard cars, we think they will attract a lot of customers. After all, who else does a new convertible at prices from £10,345? First, a bit more about the cars. As you know, these are the second generation Citroen C1, Peugeot 107 and Toyota Aygo, all of which follow each other down the same production lines at Kolin in the Czech Republic. The trio are now more different from each other than they were in their original 2005 incarnations. But the C1 and 108 share more similarities. 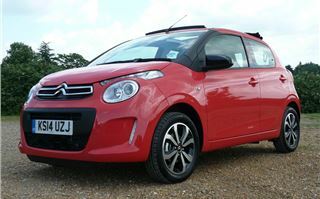 The C1 and 108 are available with 3 or 5 doors, the optional fabric sunroof and a choice of two engines: the original 998cc three cylinder now with 68PS or Peugeot’s new 1,199cc Puretech three cylinder here developing 82PS. 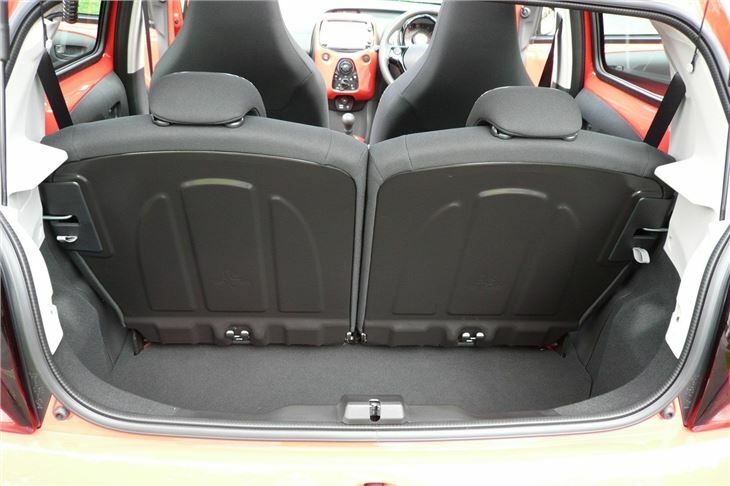 So far, the Aygo only comes as a 5-door and so far with no sunroof or Puretech 82PS engine option. 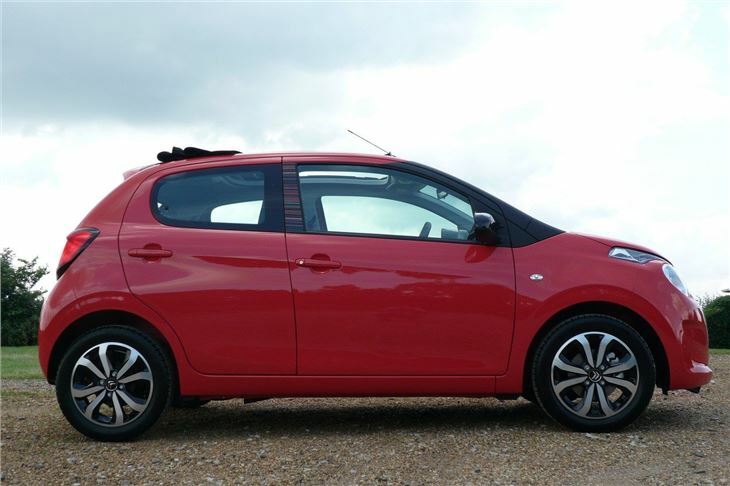 You can read how else the 2014 Peugeot 108 and 2014 Toyota Aygo differ in their Car-by-Car entries. 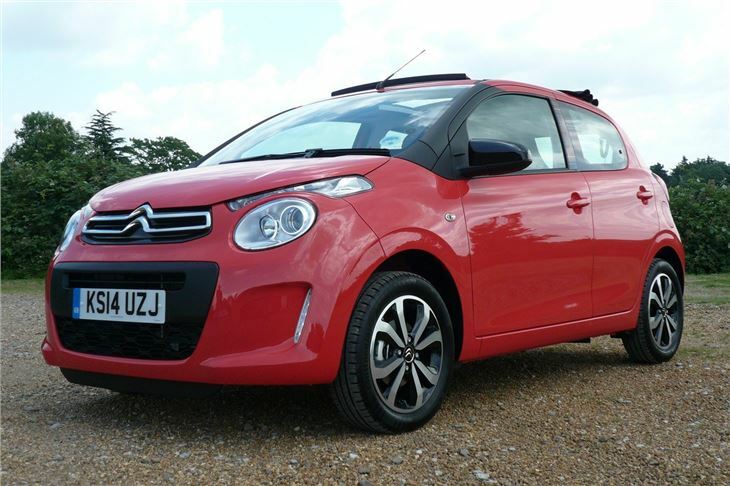 C1 list prices kick off at £8,295 for the base spec ‘Touch’ model, then jump to £9,495 for the ‘Feel’ 3-door and £9,895 for the ‘Feel’ 5-door. 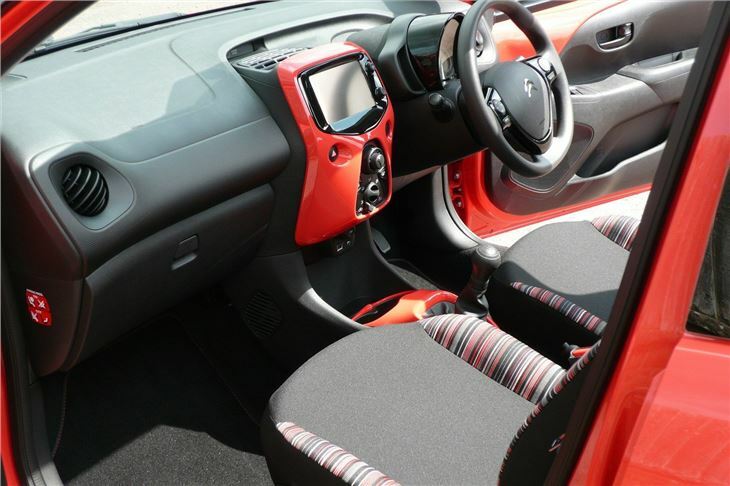 This makes the launch model C1 Airscape 68 ‘Feel Edition’ that we drove look reasonably good value at £10,890. 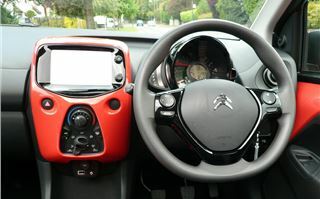 Inside the C1 the dash is dominated by a 7” touchscreen that operates the FM/DAB radio and hooks up via a USB socket to a smartphone (initially a Samsung Galaxy but an App is on the way to make it compatible with iPhones). 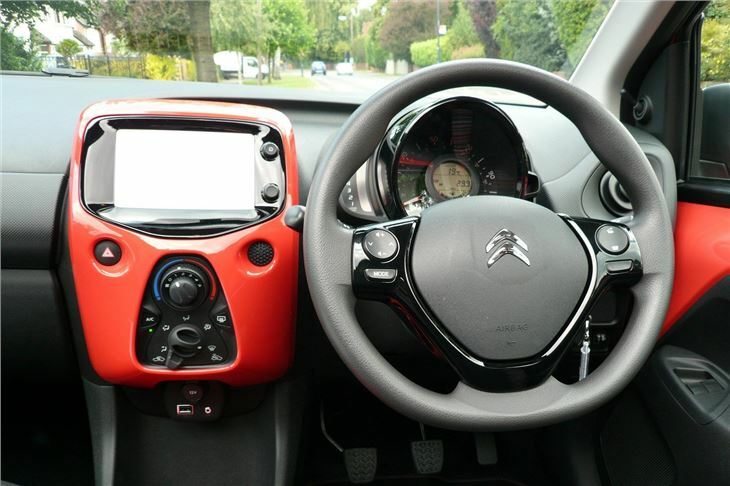 The brilliance of this is that the touchscreen then becomes the operating screen for your smartphone, so you (or your passenger) can not only make calls, text, Twitter and Facebook, you can play your own music, and you can use the smartphone navigation App. That means your mapping gets updated every time you upload an App update, but has the disadvantage that, unlike standard satnav, you need a phone signal, so it won’t work in tunnels and places off your phone provider’s radar. 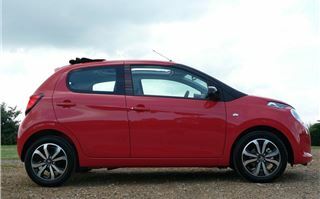 Start the car up and you hear the familiar busy ‘thrum’ of the C1, 107, and Aygo 3-cylinder VVTI engine. It only has 855kg to pull along, so it’s not sluggish. 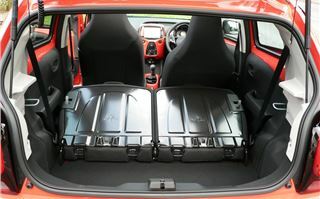 But on 165/60 R15 Continental Eco Contacts it lacks the ‘go-karty’ fun factor of the VW Up family. However, those deep profile tyres have a purpose. They soak up the bumps, potholes and other road scars very well indeed. On our drive we spotted a VW Up fitted with what looked like aftermarket 17” wheels and 35 profile tyres. We didn’t envy the nut behind the wheel. You can open and close the sunroof at what Citroen guardedly describe as ‘motorway speeds’. I can guardedly tell you that it works fine at slightly more than that. It whistles a bit. 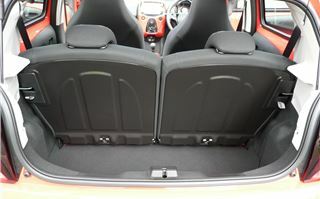 Opening the rear door vents helps sort out the air pressure inside the car. But these are small prices to pay for open top motoring at a very low price. The front seats are reasonably comfortable. 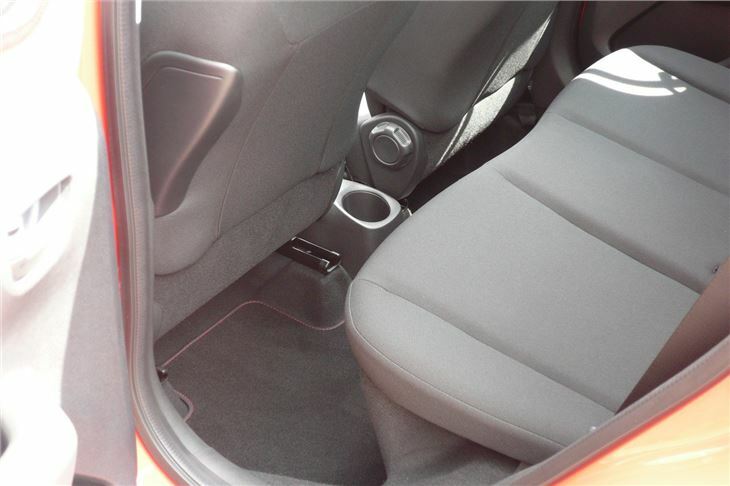 ‘Feel’ spec upwards have height adjustable driver’s seats with a range of about three inches. The instrument binnacle goes up and down with the height adjustable steering wheel. The soft rim wheel itself feels good with bumps on the inside to encourage your hands to hold the quarter to three position. There’s not a lot of legroom in the back, even behind a 5’ 9” driver. 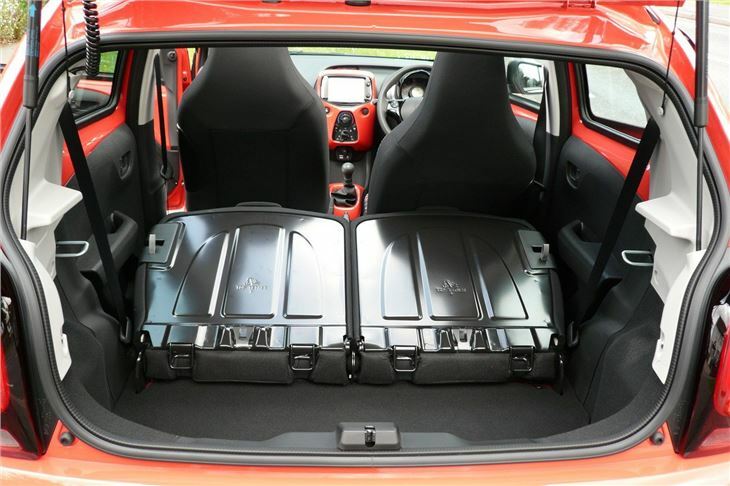 The loadspace is just 196 litres, extending to 780 litres with the rear seatbacks flopped down. 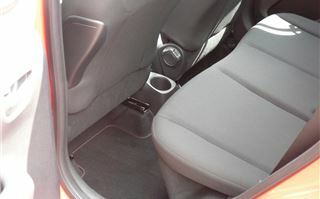 But the metal covered backs of the seats will get scratched if you don’t put a covering down to protect them. A space saver spare is a £70 optional extra. After our 60-mile run we did it over again in a C1 Airscape 82 Flair, and while that didn’t feel like a racecar in comparison, it certainly had a lot more go. The reason is not so much the extra 14PS, but the 23Nm more torque developed at much lower rpm. So driving involves less gearchanging, overtaking is safer and you feel more relaxed. Gearing is about 23mph per 1,000rpm in 5th so it’s okay on motorways too. And though, in theory, you may sacrifice a few miles per gallon, it’s still under 100g/km CO2 to VED is free. Perceived quality also seems to have improved. Whereas the old C1’s doors closed with a clang, the new car’s close with a clunk. We came away from Citroen’s HQ smiling. 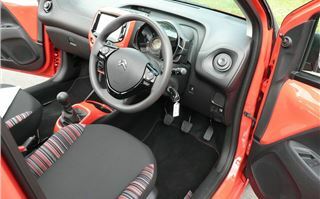 What had seemed at first to be the ugly ducking of the C1, 108 and Aygo trio, actually has a lot of character. 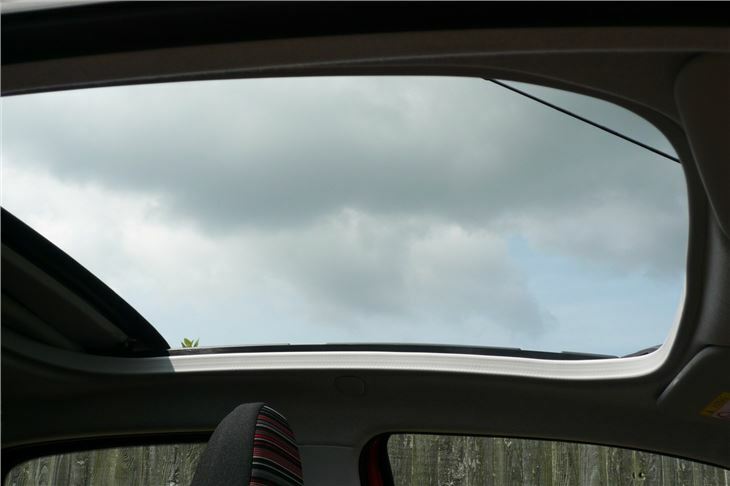 And that Airscape sunroof is the clincher. 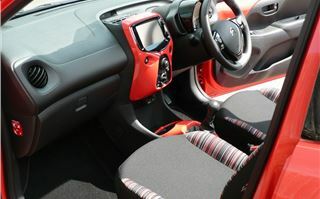 So far, the only other car that comes close is the FIAT 500C. And the starter price for that is £13,105: a full £2,760 more.